The SVDS Customer Knowledge offering helps you increase sales, engagement, and operational performance by giving you the tools to better understand your customer, so you can tailor your products to meet their needs and optimize their experiences. Building and nurturing a strong customer base requires attracting the right customers and optimizing their interactions with your products and brand. Doing this relies on deep knowledge of your customers’ motivations and behaviors, and how they evolve over time. The proven SVDS approach delivers the ability to understand what your customers really want and need. We help you build a unified, omnichannel view of customer behaviors and preferences, and develop models to explain and predict their actions. By optimizing customer interactions and effectively targeting when needed, you can examine all touch-points and intentionally create a unified customer experience. Fine-tuning this experience allows you to grow mutually beneficial relationships with your customers that drive success across every part of your business. Gaining thorough customer knowledge requires the ability to integrate data from across your organization into a holistic view of your customer—and the capability to use that data to predict future customer behavior and needs—supported by the right instrumentation for gathering necessary information about your customer. The output you’ll get from our Customer Knowledge offering is custom-tailored to your particular needs, and may include a combination of analytical outputs and platform capabilities. If you’re not yet using exploratory data analysis (EDA) to learn more about your individual customers, markets in general, and favorite product features, then we’ll start there. 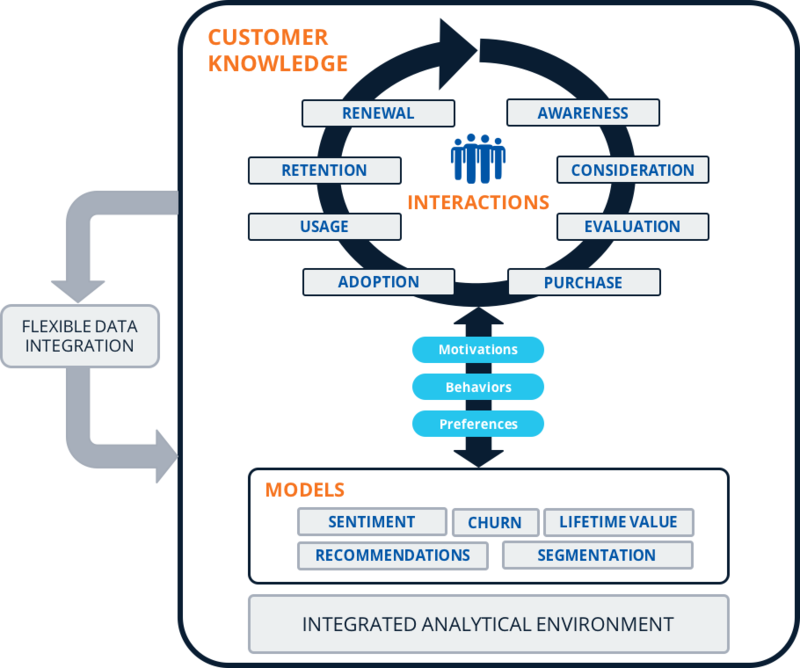 We can also help you design, build, and implement customer knowledge analytical models, including predicting customer churn and lifetime value. If you’re further along in using data to understand your customer, we can also help in other ways, such as journey path analysis and anomaly detection. With enhanced knowledge of your customers and the technology to support ongoing analysis, you can truly understand your customers and what they are looking for when they come to you for goods and services. Is Your Customer Journey Set Up for Success?